|Blog|Body|The Truth About Tummy Tuck Recovery: Does it hurt, really? What are the advantages of EXPAREL®? As Patient Counselors, Carrie and I have listened to many tummy tuck patients at our plastic surgery center serving patients in Denver and Golden, CO. We have talked with these patients before surgery and after recovery, led patients to push through their fears, and have even recovered from tummy tuck (abdominoplasty) procedures first hand. We meet with women daily who want to eliminate sagging skin and protruding abdominal muscles, and reduce the amount of stretch marks left behind after pregnancy or weight loss. However, many patients have become so frightened by the perceived “painful” recovery that they postpone scheduling for months and sometimes years! Listen up! Procrastination is a big mistake! Why put off the future of a sleek, flat, bikini-wearing, defined stomach for a few weeks of discomfort? Understanding the truth about pain, taking advantage of modern pain management, and setting yourself up with ample recovery time and support will make for a successful recovery. The pain during tummy tuck recovery does not outweigh the amazing results afterwards. Keep in mind, the human psyche is extremely masterful at dramatizing a painful recovery scene before we have experienced the event. The truth is, nothing about the tummy tuck recovery is excruciating. The discomfort after a tummy tuck comes, not from the incision (which will actually be numb for some time), but from the muscle tightening. Patients find normal activities such as standing up straight, walking up stairs and getting out of a seated position or bed uncomfortable because the core muscles are sore after being sewn together from the breast bone to the pubic bone. Think about it this way: A tummy tuck is basically military boot camp for the abdominal muscles. Those stubborn muscles loved the roominess of your loose abdomen. For about a week, they retaliate by acting sore and tired. Those muscles quickly become angry and fatigued from the layers of sutures placed to keep them tight. The muscles soreness diminishes after a week and becomes less at the forefront of the mind. Most women are walking upright and going about daily “to dos” after just 2 weeks. Patients go back to working out at 4 to 6 weeks post-tummy tuck. Some report small muscle “zingers” with workouts or yoga, which is completely normal. However, we advise patients to go back to working out slowly and back off it it hurts. Many of our extremely active patients get back to working out sooner and report stronger core strength as an added benefit. EXPAREL—a true game-changer in pain management. In addition to using a no-drain tummy tuck technique and prescribing the best oral pain medications available, Dr. Vath, Dr. Wolfe, and Dr. Steinwald offer EXPAREL for long-lasting pain control. This non-narcotic, non-opioid pain reliever is injected directly into the abdominal tissue, fascia, and muscles during surgery. It is effective in managing pain for up to 72 hours post-op. 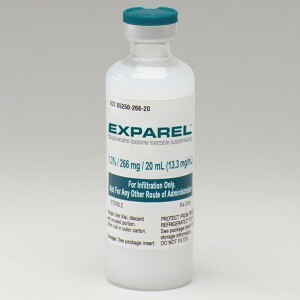 Not only does EXPAREL help patients get through the first 72 hours post-op with greatly reduced discomfort, it is also great for patients who wish to limit the amount of narcotic pain meds they take. Oral pain relievers can cause extreme drowsiness, fatigue, nausea, and constipation in some patients. Our patients who opt to add EXPAREL to their procedure report a 50% reduction in narcotic pain medication consumption vs. those who do not. EXPAREL adds $500 to the total surgical investment, and the patients who have used it feel it is well worth the cost. Additional considerations for a smooth recovery. Set yourself up for 2 weeks of doing nothing but recovering. Carrie and I counsel patients about getting into the “recovery mindset.” Most of us modern women are busy and overscheduled. We do it all, from working, cooking, rearing children, exercising, and volunteer work. We like to think we are superhuman. This notion can make for a frustrating and uncomfortable recovery process because we aren’t able to keep up with the demands and responsibilities of “normal” life during the first 2 post-surgery weeks. Sleeping a lot is normal (and encouraged!) during recovery. You shouldn’t be making any important decisions or responding to serious e-mails while on pain medication. Remind yourself that this is SURGERY and you need downtime. You will feel better, and your energy will come back in a few short weeks. However, you will not be able to run the household or your career by yourself during this time. Enlist your family and friends to help out with meals, cleaning, running errands, and watching the kids. You’ll be glad you asked for support. 9 Responses to The Truth About Tummy Tuck Recovery: Does it hurt, really? What are the advantages of EXPAREL®? As a nurse for over 44 years, I noted that patients with pain fell into two categories: those with a very high pain tolerance & those with a very low pain tolerance. There is no minor surgery. All surgery involves some degree of pain. A tummy tuck is a major procedure. Medals are not awarded to patients who do not take a reasonable amount of analgesic medication over the acute phase of their recovery. Expect some pain, but be nice to youtself. Take your meds, so you can get up & move to participate in your return to wellness. Great points, Sally. We by no means were trying to downplay the discomfort involved with a tummy tuck, which is, as you pointed out, a major surgery. It is a fine line with the narcotic pain meds between staying on top of pain and possibly taking more than needed. That’s why we are so excited about the Exparel. After having this surgery almost 10 years ago, the pain was WORTH EVERY bit of the benefits I still see. Curious as to your age when you had it done? Would you recommend doing it if you are 68? I was in my mid-30s when I had my Mommy Makeover, however, we have performed tummy tucks on patients in their 60s and even into their mid-70s. As long as you are healthy enough to undergo general anesthesia for 2-2.5 hours, there is no reason why you shouldn’t have this procedure if your tummy is an area that bothers you. We are always happy to see you for a consultation to discuss the tummy tuck procedure in depth with you. I am hoping that was a typo and that your TT is NOT being performed by an eye doctor. In regards to your question, it is routine for TT to be performed as an outpatient procedure. This may change on a case-by-case basis depending on if the patient has a health history that would warrant an overnight hospital stay. As for as your concerns about pain meds, I urge you to discuss it with your Plastic Surgeon, as there are different things he/she can prescribe. I would also think about adding Exparel to your procedure. Best wishes for your procedure! Hope it turned out well for you. I had it done 8/17 and so far I’m thrilled. My doc just met me on Sunday to pull the drainage tube and I am ever so thankful. He said most tummy tucks he removes 2-3 lbs of skin. He removed 6 1/2 POUNDS from me. I’m presently 64 and already looking forward to having my thighs done. I lost 75lbs and I just don’t think that much skin will tighten itself up.